Do you have a techie in your house? I have a couple in mine and I am always looking for things that they will love. Gift giving can be so difficult for tech lovers…until now. I have found a list of 30 cool DIY tech accessories that your techie will love. You will love them too, and in fact, you will realize that you have always needed these cool tech accessories. You just didn’t know it until now! 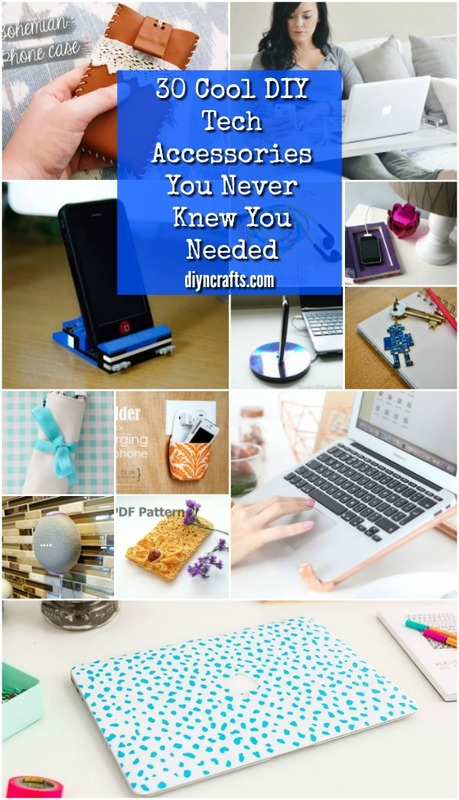 From laptop bags that you can make from upcycled sweaters to charging cord organizers and just about anything else you can imagine, you are going to adore these cool DIY tech accessories. There are DIY headphone covers and so many wonderful DIY phone stands. All of these are super easy to make and are perfect for giving as gifts to any tech lover that you know. And if you love doing your own DIY gifts, you should be sure to check out these 30 beautiful crochet gifts that you can make today. There are even a few crochet projects in these DIY tech accessories. From organization to style, there is something in this list for everyone. Tech accessories can be so expensive if you buy them in stores, particularly in stores that only sell tech accessories. You won’t have to worry about cost with these DIY projects, though. They are all super cheap to make and you are definitely going to love how easy they are. You can finish most of these in about an hour or less and they are all things that you definitely need if you are a lover of technology. Some of them could even double as hostess gifts, like these 25 thoughtful DIY gifts for the home! 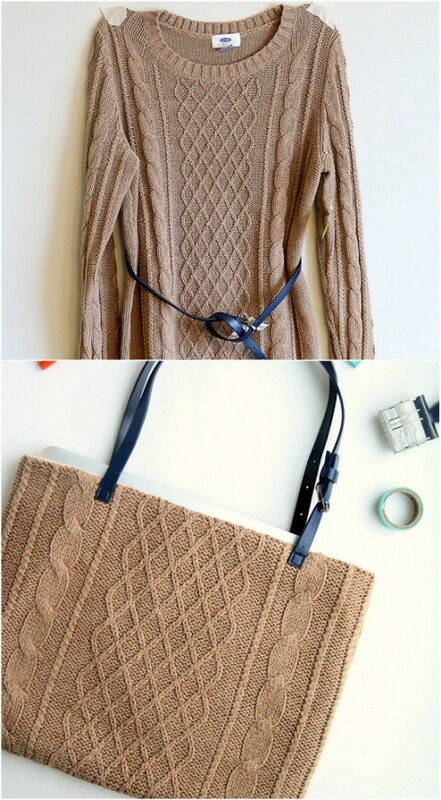 An old sweater is all you need to create this lovely DIY laptop bag. You want your laptop to be protected when you are traveling and maybe even a bit more comfortable to carry. This DIY laptop bag is super comfy for carrying and it helps to keep your laptop safe and secure. Plus, it’s a really stylish bag to make and it takes very little time to get it done. Don’t you love good upcycling projects for old sweaters? It’s not cold out right now, but it will be before you know it. Before it does turn colder outside, make yourself a pair of these awesome tricked out headphone covers. 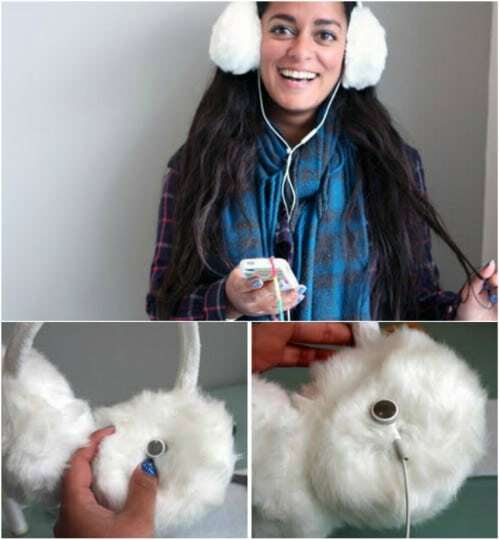 You make these with an old pair of earmuffs, some felt and of course, your headphones. The covers are so stylish and so much fun to wear and they will definitely keep your ears warm while you’re listening to your favorite tunes during the winter months. Did you know that a simple cheap balloon could protect your iPhone? I love the idea of making an iPhone casing out of a balloon. Not only is this an effective phone cover, it’s super cheap. You can get a bag of balloons at the Dollar Store for a dollar and make a phone casing for every phone in your house. Plus, whenever you’re ready to change colors, you just use a new balloon. 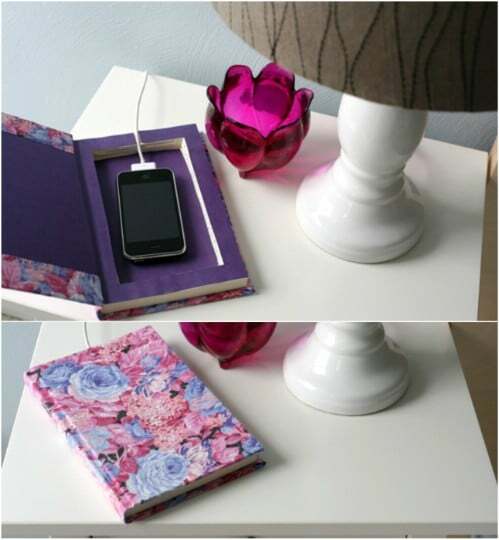 Take an old hardback book and turn it into this stylish phone charging station. When you aren’t using the station, you can just close the book and hide it all away. This is such a neat little project and it’s pretty easy to do. If you have ever wondered what to do with all of those old books, here is the perfect project to get you started. And if you don’t have an old book that you want to use, check your local thrift stores. They have plenty! If you tend to have a lot of old electronics laying around the house then there is a good chance that you have some old circuit boards. You can turn those old pieces into the most amazing tech savvy coasters! 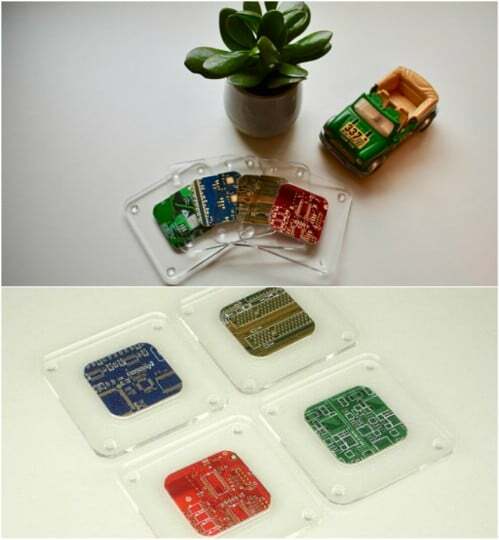 These are so neat and would make the perfect gift for any lover of electronics. You can make these pretty easily yourself, or take a look at the ones that I found on Etsy for just over $5 each. If you tend to travel quite a bit (or at all, really) then you definitely want to keep your cords from tangling during your trips. 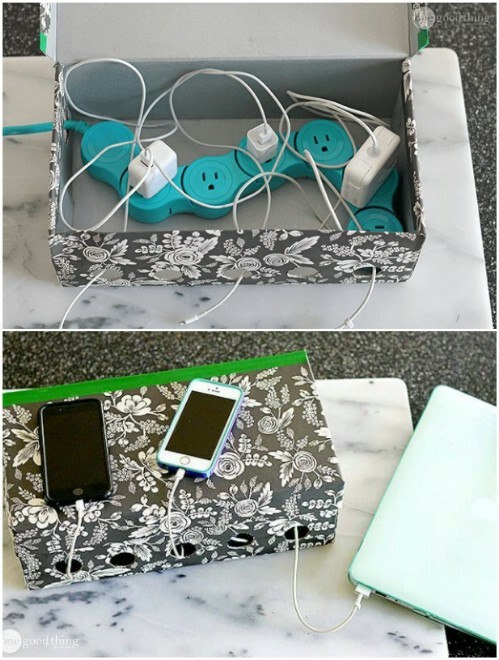 This DIY travel cord organizer is perfect for protecting those cords and keeping them organized. It’s a really simple project. Not only does it keep the cords organized, the organizer folds up so that it takes up very little space when you are packing. iPhones, iPads, tablets…there are so many things that families need to charge and sometimes they all need to charge them at the same time. This DIY family charging station is one of the easiest tech accessories to make and it is something that all families need. You make this with a shoe box, a surge protector and just a few other supplies and you can have it completely finished in about an hour or less. I do love a good crochet project, particularly crochet projects for beginners. 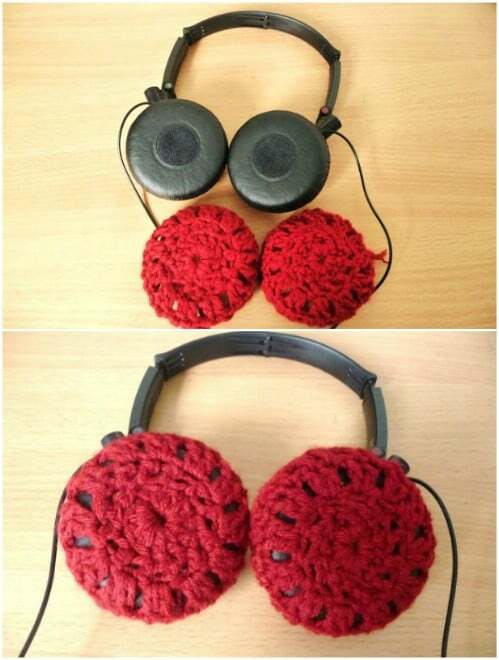 These DIY crocheted headphone covers are perfect for beginners. The pattern is so easy to follow and they make wonderfully stylish covers that will protect your headphones and even keep your ears warm when it is cold outside. This is a great crochet project for first timers, too. You can get in loads of practice making a pair of these for everyone in the family. You really have to love easy crochet patterns for beginners! If you need a case for your phone and you aren’t a huge fan of those premade ones in stores, you can simply crochet your own. This one is lovely with a floral theme and it’s a really simple pattern to follow. 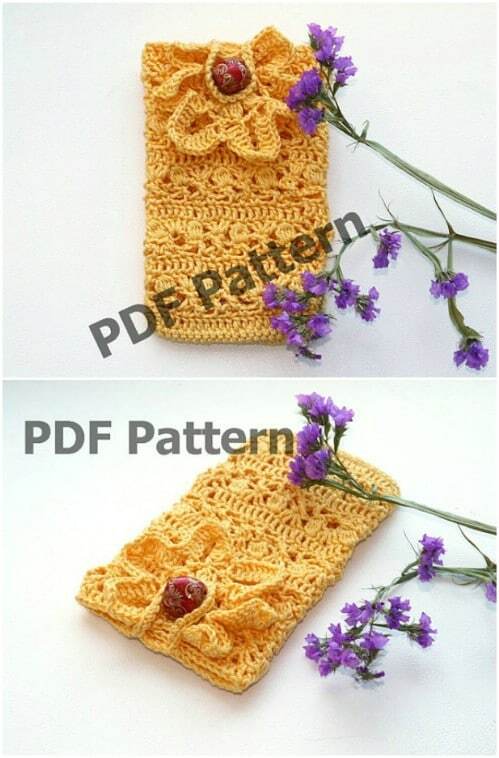 You can crochet a phone case for any phone model and brand so it doesn’t matter if you are sporting the latest iPhone or your Android from three years ago. I found this lovely pattern on Etsy and you can get it for less than $4. Did you know that you can make a black light for your phone? Did you know that you even wanted a black light for your phone? You will definitely want this one when you see how easy it is. To make this DIY black light for your phone, you need a phone of course, along with some Scotch tape and a few sharpies. Honestly, this entire project will cost you less than $5 and it’s so much fun! If your house is like mine, you have youngsters fighting over whose iPhone charger belongs to who. They are constantly losing these things and then taking ones that really don’t belong to them. 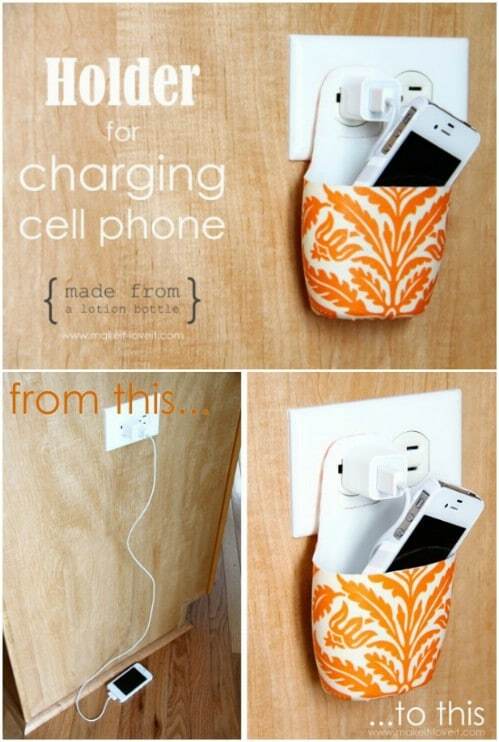 If you have this problem too, you can solve it easily with these DIY decorative iPhone chargers. Just decorate everyone’s iPhone charger differently and they will never take one that doesn’t belong to them again. You really will be surprised to learn about the many recycled CD projects that are out there. 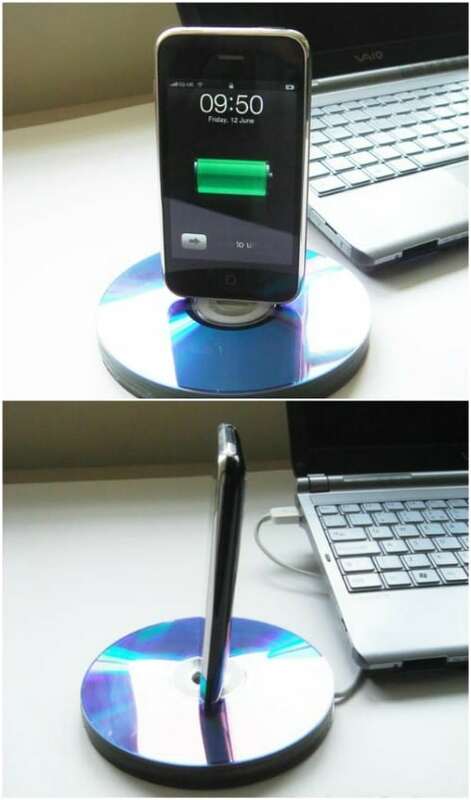 This one turns those old otherwise useless CDs into an amazing iPhone dock. It’s a really simple project and makes a wonderful gift for anyone you know who loves technology. You can make this to fit any phone or tablet that you have and you only need a stack of old CDs and some basic craft supplies to do it. 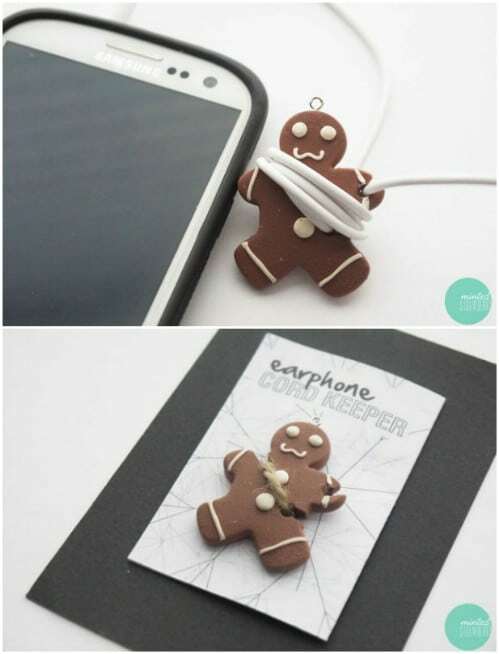 These little DIY gingerbread men earphone cord keepers would make the perfect DIY stocking stuffers. But, you can make these anytime of the year or even do them in a different style. You use cookie cutters to mold them so you could do them in any shape or design that you have a cookie cutter to match. They’re really cute and so much fun to make. You can take a cheap pair of headphones – the Dollar Store has them for a dollar or two – and turn them into a more expensive pair with just a bit of embroidery thread. The thread helps to make the earphone cords stronger. If you have little ones, you know that the first thing to go on those cheap headphones is the cord because they pull on it so much. 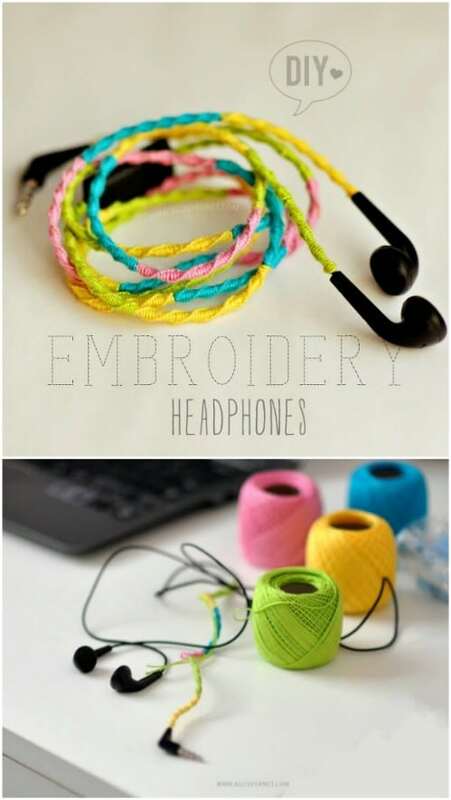 These DIY embroidered headphones will put an end to that and they’re so colorful! Did you get the gift of Google for Christmas? Or, have you just decided that it’s past time for you to bring your home into the age of electronics? 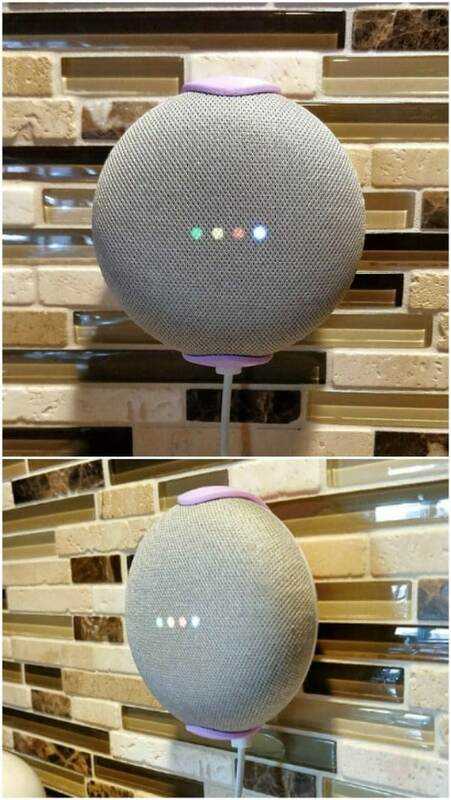 If you have a Google Mini, this wall mount is an excellent tech savvy DIY for you to try. The Mini is so lightweight that you could make your own wall mount out of just about any material. I found this one on Etsy. It’s made from PLA filament and it’s under $7. My kids had so many Legos when they were younger. Of course, most of those have since been sucked up into the vacuum or otherwise disposed of but I do run across a few every now and then. 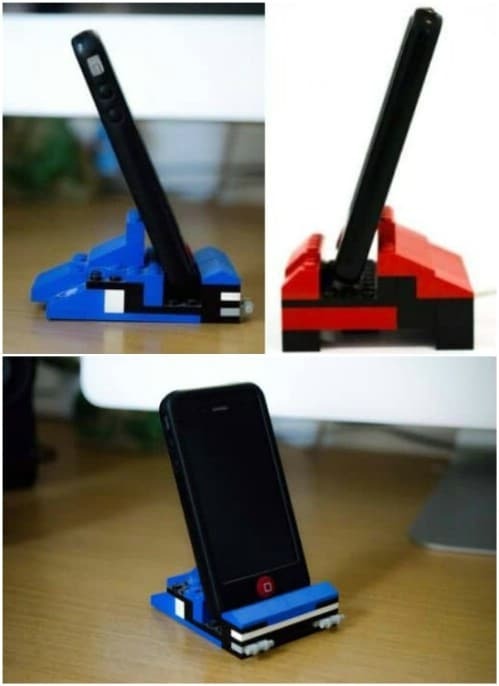 I’m saving them up for a special DIY project, like this amazing DIY Lego phone holder. If you love building with Legos, you are going to adore making this little tech accessory. It’s perfect for kids and adults alike. 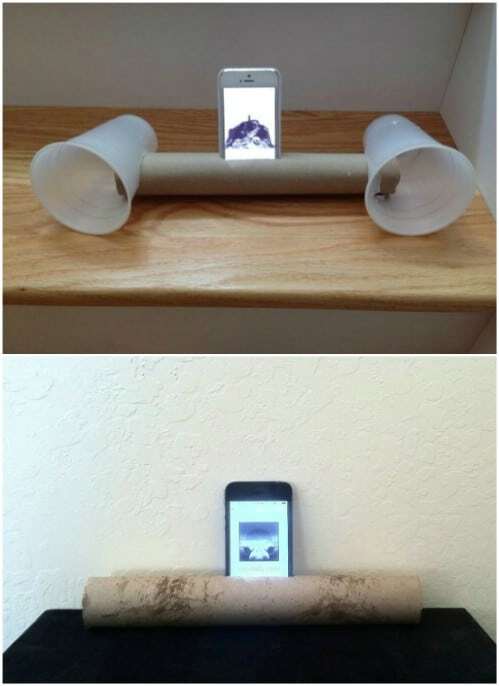 An empty paper towel roll and a couple of plastic party cups are all you need to make this amazing DIY portable iPhone speaker system. Actually, you could do this for any type of phone that you have. The cups hold the paper towel roll in place which in turn, holds your phone. The cups also work as amplifiers to make your phone speakers sound so much louder. This is the perfect DIY tech accessory for outdoor summer activities. Talk about uses for paper towel rolls you’ve never imagined! A couple of pieces of plastic pipe can be turned into this amazingly cool DIY laptop stand. 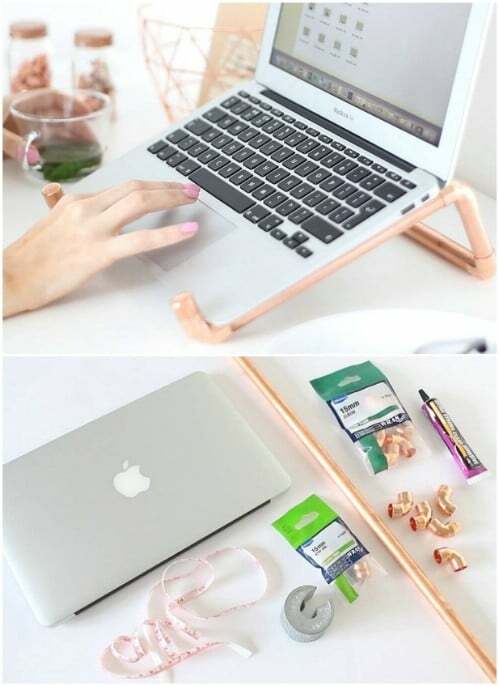 Not only is this a gorgeous laptop stand to look at, it holds your laptop up perfectly and puts it at just the right angle for working or for online shopping. This is a super easy one to make and it’s definitely more unique than anything you can find in a store. Do you tend to browse the internet while you’re lying in bed? Do you often work long hours at night? If so, you definitely need this DIY wooden laptop tray. This makes it so much more comfortable to sit with your feet up and use your laptop. It’s large enough so that you have more than enough room for your laptop as well as your phone and other necessities and it’s a super easy DIY project to make. 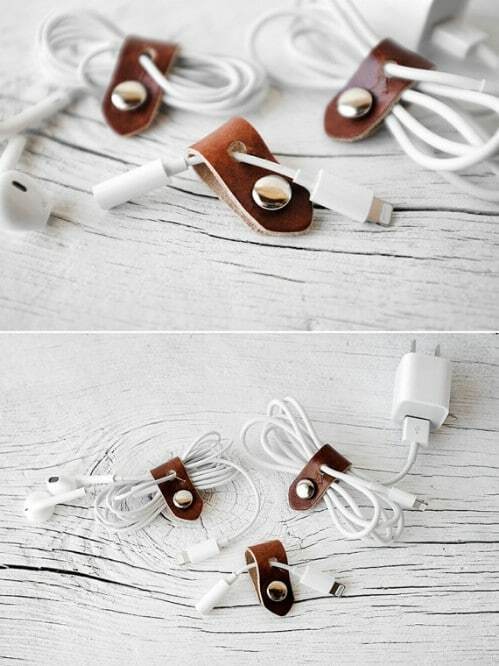 Keep all of your electronic cords organized with these neat little leather organizers. The leather snaps together, holding your cords perfectly coiled and in place. You can make one of these in just a few minutes and they really help with those cords when you are packing for vacation or business trips. I found these on Etsy for around $5 each and they come in a wide range of different colors. If you’re a fashionista, then you want your tech goodies to be fashionable, right? This DIY lipstick case serves as a holder for your flash drive and it just doesn’t get any more stylish than this. You can make this yourself pretty easily and it only takes a few minutes to do so. 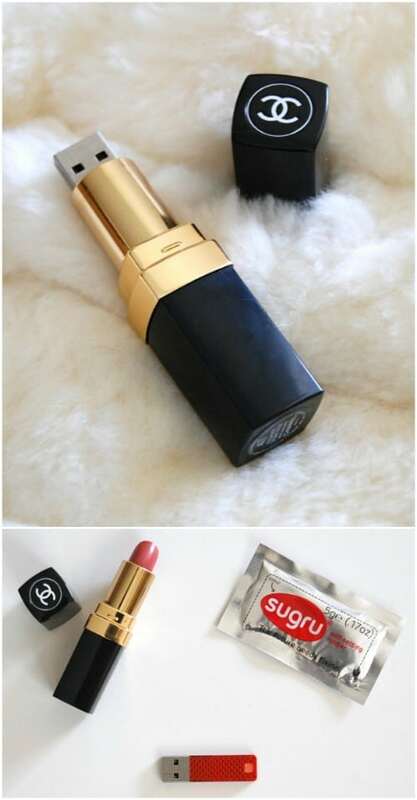 You will need a standard flash drive as well as a tube of your favorite brand of lipstick and a bit of specialty glue to make these. An old lotion bottle can be recycled and turned in to this amazing hanging charging station. This is great for when you need to charge your phone but there isn’t a table nearby and you don’t want to just lay your phone in the floor. You can even decorate these to make them look really nice and they are super easy to make – and all you need is that empty lotion bottle. This is a fun and creative upcycling idea for plastic bottles. If you run, walk or otherwise do activities that require the use of an arm band, here is a great one for you. This DIY phone holding arm band is made from an old sock. If you have ever wanted a project that lets you repurpose mismatched socks, here it is. 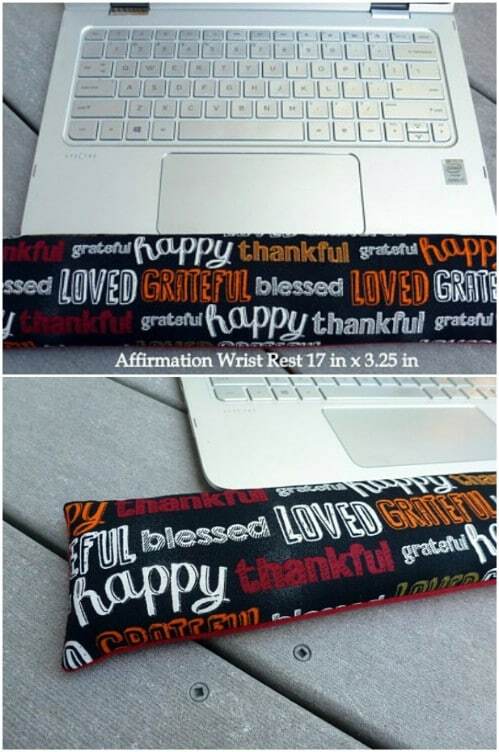 This is so easy and it makes the most comfortable arm band. And, these are one size fits all so you don’t have to worry about sizing it up or down. Do you feel pain in your wrists when you sit at the computer too long. This can be a problem, particularly if you work at a computer. So, you need a DIY keyboard wrist rest. These are super easy to make and you can use any type of fabric – or even repurposed towels – to make them. Stuff with rice and they are super comfortable. I found this one on Etsy and it’s just $9.50. Have you ever been out and forgot your phone charger? Or maybe you have been out camping and just couldn’t charge your phone. 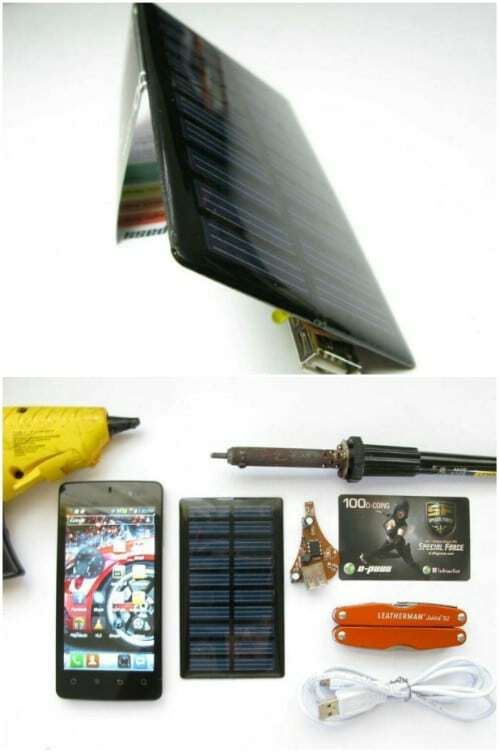 You definitely need this DIY portable solar phone charger. The best thing about this is it will charge your phone up using solar power. Plus, it only costs $5 to make and it’s super easy to put together. If you tend to always find yourself without your needed charger, this is definitely a must have tech accessory. 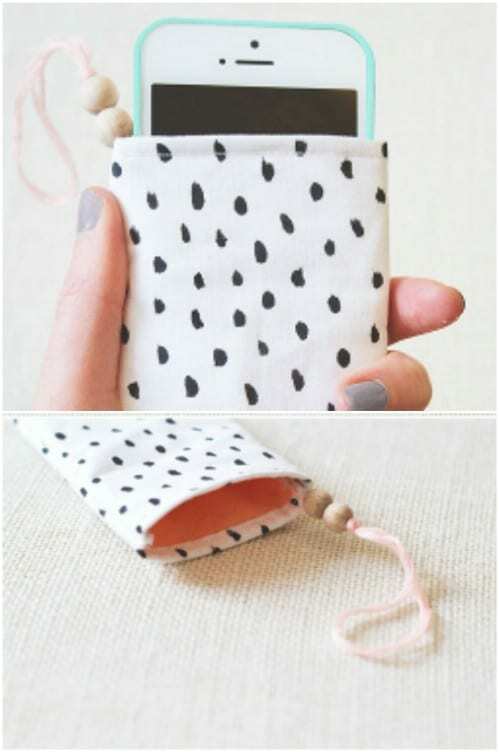 This easy to make DIY phone pouch is perfect for carrying your phone without actually having to carry it. This is pretty room so you could also drop cash, credit cards, keys and other necessities down into this little pouch and go off without worrying about having to carry a purse. This is a simple DIY pouch to make and you can do it with scrap fabric that you have left over from other sewing projects. 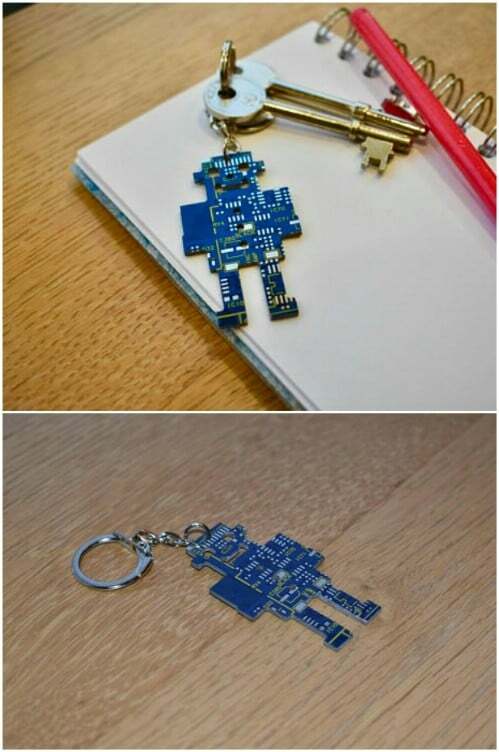 This little robot keychain is made from an old circuit board and he is darling. 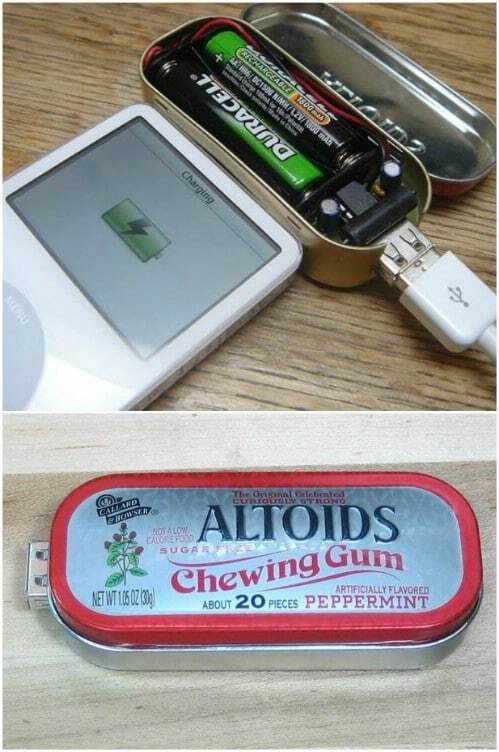 This is a great gift idea for tech lovers and it would be super easy to make. If you have an old mother board or circuit board, you just draw out your design and cut. Or, you can simply check out this adorably little fellow that I found on Etsy. They are made from real blue circuit board and have shiny silver accents and you can get one for less than $7. This small battery powered USB charger can save you when it comes to needing to charge your electronics. This one charger works for everything from your digital camera to your cell phone, mp3 player and any other electronic gadget that needs a charge from time to time. It’s a pretty simple one to make, too and will definitely come in handy if you’re out and about and can’t plug your electronic in at home to charge. If you love the bohemian look then you definitely want this boho style phone case in your life. This is a really easy DIY phone case to make and it has such a nice style – if you’re into that look, that is. The chic and shabby look is all the rage right now. 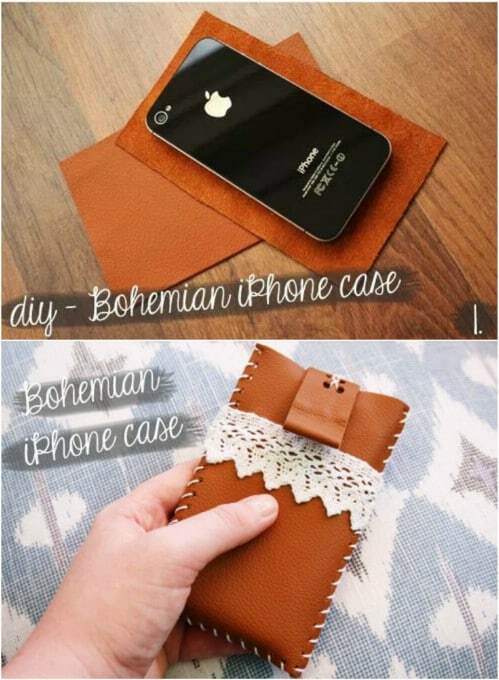 If you love DIY chic and shabby décor then you will adore this boho styled phone case. It’s made with leather and lace in true boho style. Add this to your DIY shabby chic boho décor! Who says you have to pay for a laptop skin? 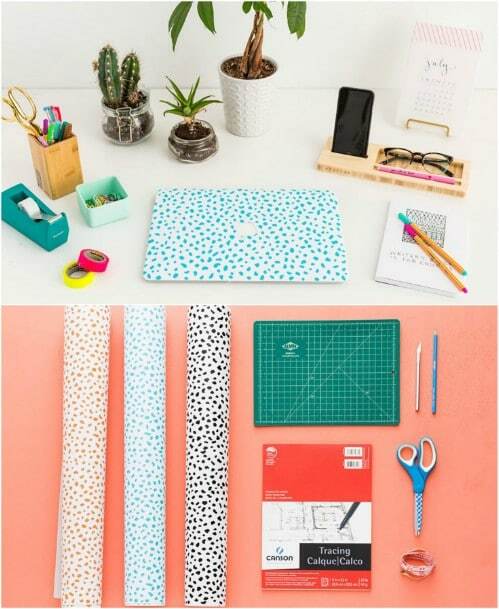 You can make this DIY laptop skin from some wallpaper and it’s gorgeous when it’s finished. Of course, how it looks will depend entirely on the design of the wallpaper that you choose to use. If you have some wallpaper left over from a remodeling project, this is a great way to use it up and it decorates your laptop at the same time.